For those interested in knowing more about the life and times of one of the most enigmatic and troubled heavyweight champs, the book "The Devil and Sonny Liston," by Nick Tosches (Copyright 2000, published by Little, Brown and Company), is a wealth of knowledge. Tosches, who hails from Newark, writes in an engaging style that is as beautifully stylish as a Liston left jab and as savagely straight-forward. The author begins appro-priately at the beginning with his subject, providing more comprehensive information about Sonny's childhood than probably even Sonny himself knew. Liston's formative years were spent growing up as a physically and mentally abused child living in a forsaken patch of land known as Sand Slough, Ark. This is how Tosches describes Liston's birth place: "It was in the sector of Morledge Plantation that lay in Johnson Township, St. Francis County, that Tobe Liston and his family came to live and farm, on a low patch where a rill of muddy water, a mile and a half or so long, dribbled dead to its end in a slough of sandy dirt where nothing could grow. The place had a name, but it was not to be found on any map. They called it Sand Slough. It was there in Sand Slough ... that Charles L. Liston was born, on the 50 acres that Tobe rented from the Man." Liston was the 12th of 13 children born to Tobe and Helen Liston (and one of 25 children sired by Tobe). Sonny was probably born in 1929, but no one knows for sure. Even Sonny's mother, who was called Big Hela, didn't know, though she believed him to be born during the month of January. Liston would later claim his birth date to be May 8, 1932, but that is off by at least two years. By all accounts, Liston had a woeful childhood. Tobe was mean to his children, and especially to Sonny. From the time he was old enough to be useful in the fields, Sonny was a laborer for his tenant farmer father. Sonny, who was known by his proper name Charles while growing up, rarely attended school and never learned to read or write, a fact that haunted him as an adult and fed a lifelong problem with insecurity. As Toches brings out, Liston's brooding temperament can be explained in part by his insecurity. It was a defense mechanism designed to keep people from getting too close. Much of what Tosches gleans about Liston's youth stem from interviews with people who lived on the Morledge Plantation in the 1930s and from Sonny's older half-brother E.B. Ward, who resides today in Forrest City, Ark. Perhaps no keener insight can be gained from those early years, though, than from what Sonny himself was quoted as saying: "The only thing my old man ever gave me was a whipping." There's no question that the hard-scrabble existence of youth prepared Liston for the success he would later enjoy as a prizefighter. Hungry fighters eager to break free from the shackles of their own environment bring an element of savage desperation into their ring encounters. That inbred struggle for survival often produces champions. Jack Dempsey and Roberto Duran are two cases in point. Liston is another. Unfortunately, the same dark forces that forged Liston's destructiveness in the ring also fueled a distrust for the police and a bent toward criminal activity that would lead to two stints in the Missouri state prison system. Those dark forces were also at work when Liston willingly placed himself in the hands of the mob that ran the fight game during the time of Liston's ascendancy to the crown. As a young man in 1949, Liston left Arkansas for good and followed his mother's footsteps to St. Louis. Big Hela had moved there in 1946. She was working in a shoe factory when her son Charles unexpectedly came to the city and looked her up. Liston didn't find gainful employment in St. Louis. Instead, he and some friends took to robbing people on the street and robbing gas stations with a loaded pistol. In a short amount of time, those felonious deeds cost Sonny Liston his freedom. 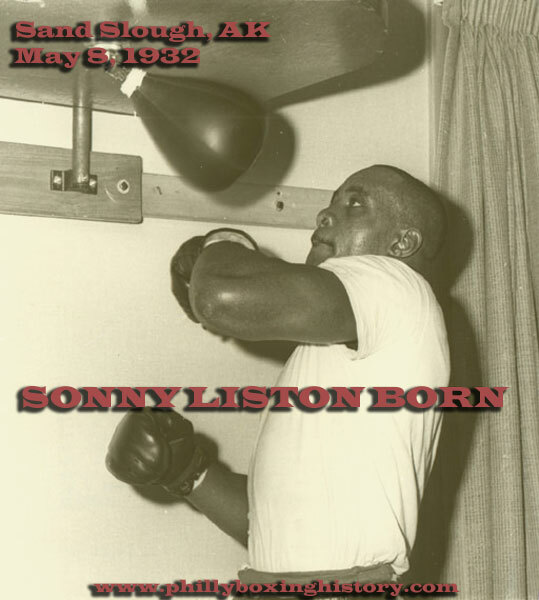 As most boxing fans know, it was in the Missouri State Penitentiary in Jefferson City that Sonny learned to box. Two Catholic priests who served as chaplains, Father Edward Schlattmann and Father Alois Stevens, helped to direct Liston toward the controlled violence of the ring. From the start, Liston was a devastating puncher. From the start, it was apparent that he had a future in the ring. During his two-plus years in the state penitentiary, Liston attained a new nickname, "Sonny," and a new vocation, boxing. With the help of a farsighted, black St. Louis businessman and some other backers who were aware of Sonny's potential, Liston pursued a ring career after leaving the joint and rejoining society at large. Liston had a short and successful amateur career, following which he turned pro. In September of 1953, he knocked out Don "Toro" Smith in two rounds in St. Louis, setting in motion a career which would span 17 years and bring Sonny to the pinnacle of success in his sport. Liston won 13 of his first 14 bouts before trouble with the law cost him his freedom a second time. In 1957, he was sentenced to nine months in the St. Louis workhouse for assaulting a police officer. Tosches does a nice piece of reporting on the incident that led to Liston's arrest, objectively revealing all available viewpoints. The reader can form his own conclusion based on the reports of those involved. Because of his arrest and prison term, Liston didn't have a fight between March of 1956, when he decisioned Marty Marshall in Pittsburgh, to January of 1958, when he knocked out Bill Hunter in two rounds in Chicago. Following his release from the workhouse, Liston quickly returned to the ring against Hunter and got his career back on track. In a short amount of time, he rose to prominence as a contender in the heavyweight division. It was around this time that Sonny decided to make Philadelphia his home. Sonny kept fighting and kept winning against a progressively better grade of opponents. Foes like the murderous-punching Cleveland Williams, Mike DeJohn and Nino Valdez succumbed to Liston's heavy fists. By that time, Liston had already attracted the attention of organized crime. Tosches goes to great lengths in his book to convey the ubiquitous presence of the mob in those days and the power that men like Frank "Gray Man" Carbo and Frank "Blinky" Palermo wielded in boxing. Basically, for a guy like Liston, it meant that you either dealt with them, or you didn't deal at all. As Liston made himself a serious challenger to Floyd Patterson for the heavyweight title, Liston made his alliance with the Devil, as Tosches refers to the mob. Because of this alliance, which was public knowledge, Liston was called before the committee investigating organized crime that had been established by Tennessee Democratic Senator Estes Kefauver. Pressure resulting from appearing before the committee, and from the diatribes of Patterson's manager Cus D'Amato, caused Liston to buy out the contract of his manager, Pep Barone, who was considered to be an undesirable, and name George Katz, an old-time Philadelphian with political and boxing connections, as his manager. It was just a matter of semantics, though. Liston was beholdin' to the mob and everybody knew it. Sonny had to put the proper face forward to the public. On top of the mob issue, Liston had to overcome more problems with the law before he could be free to fight Patterson for the title. He was arrested twice in a period of months in Philadelphia in the summer of 1961. For a while, he even lost his license to box in the United States. After having his license revoked, Liston made a smart decision, as he had when he bought out Barone. He put himself under the care of still another Catholic priest, Father Edward P. Murphy, a kindly Jesuit who was the pastor of a predominantly black church in Denver. Liston relocated to Denver with his wife Geraldine and friend/sparring partner Foneda Cox and underwent extensive counseling with Father Murphy. Liston's purpose was to show the Pennsylvania State Athletic Commission, and the world, that he was turning a new leaf. Liston celebrated the speedy reinstatement of his license with an impressive 1-round knockout of German baker Albert Westphal, who was ranked No. 4 among heavyweights, on Dec. 4, 1961. On the same night at a different location, but on the same closed-circuit broadcast, Patterson defeated unheralded Tom McNeeley in four rounds in what would be the final successful defense of his crown. carrying the theme of Liston and the mob beyond its logical parameters. During the years that Liston was champ, the mob was in retreat. Yet, Tosches postulates that Liston threw his first fight with Cassius Clay in Miami in February of 1964 at the behest of the mob. That doesn't make sense. Clay was no debtor to the mob. What advantage would there be to having the brash young boxer from Louisville installed as heavyweight champ in place of Liston? Tosches here betrays an ignorance of boxing that no doubt hurts his credibility with those know the sport. Tosches insists that films of Liston losing to Clay reveal that Liston was missing punches intentionally. Clay, later to be known as Muhammad Ali, may have had the fastest hands of any heavyweight ever to lace on a pair of gloves. Clay is certainly to be counted among the greatest heavyweights of all time. Did he need Liston's cooperation to beat the rapidly aging champion that night in February of 1964? Hardly. If it was truly a fix, then Liston would have found a way to avoid taking the punishment that he received at Clay's hands before retiring on his stool after the sixth round. As for the rematch between the two fighters in an ice rink in Lewiston, Maine, in May of 1965, there are a lot of possible explanations for Liston's bizarre actions that night. Maybe Liston realized that he couldn't beat the youthful Clay/Ali, and he opted not to get up off the canvas in round one instead of absorbing another beating. Maybe Liston was concerned about the death threats that had been made against Ali in the wake of the assassination of Malcolm X and Liston just wanted to get out of the ring that night as quickly as possible. Tosches' explanation, of course, is that Liston was again dutifully following orders given by the mob. Liston continued fighting following the loss of his title, mainly because it was the only legal way he knew how to make a buck. He was still a fringe contender at the age of 40 or so when he died under mysterious circumstances in December of 1970 at his house in Las Vegas. Some suspect foul play; others believe Liston died of a self-inflicted drug overdose. Tosches believes the latter. As with the date of Liston's birth, no one knows for sure. Tosches is admirably objective in his presentation of Liston. The dark side is evident. The continual conflicts with the police. At least two sexual assaults. Womanizing. Drinking. Gambling. Armed robbery. Aligning himself with the Devil. busy highway, so that Liston could go and buy some pencils from an obviously poor, old, white women whom he had observed. Liston emptied his pockets of bills and returned to the car with all of the women's pencils. In the end, one can't help feeling some sympathy for Liston. He was a victim before he was ever a brute. He overcame tremendous odds to win the title and earn a measure of fame, but even so he was never embraced by the public. That hurt him deeply, though he instinctively hid the scars behind a scowl. He died in Vegas as mysteriously as he had lived, a man bent under a great shadow, afflicted by a legion of personal demons that no one could exorcise. Least of all, Sonny himself.